We mostly keep away from dragons and such to do some of the more obscure creatures in the D&D bestiaries. Those ones are usually a bit weirder and a bit what, but they're sometimes pretty cool and need more love. But in special occasions like these, you need to go back to the classics. Specifically, the classic final boss of the campaign and proof of your heroicness. Among all the dragons, the Red Dragon is the one you really have to watch out for. They are the classic dragon: fire breather, gold hoarder, maiden eater, town razer. 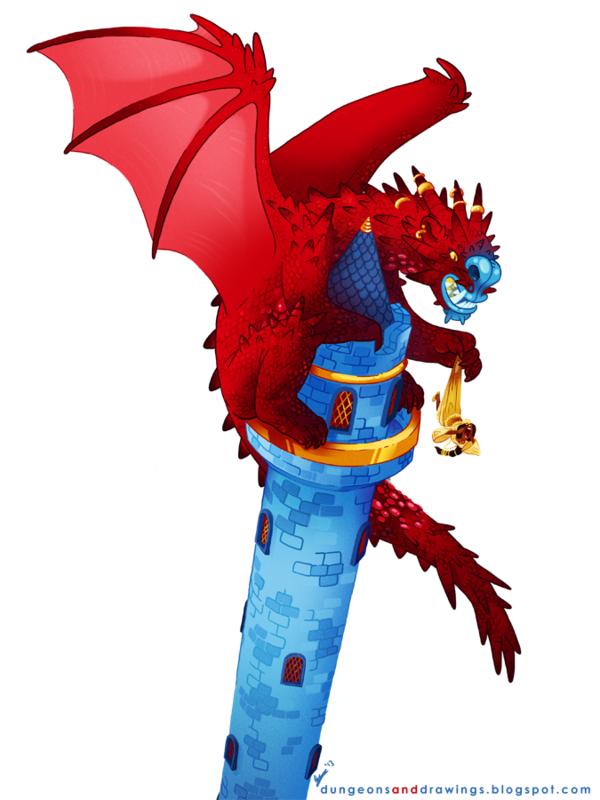 They are cruel, vindictive, greedy creatures and amongst the most powerful of dragons (only a fully grown gold dragon is stonger than a fully grown red). Even straight out of the egg, they're already the size of a human and are capable of taking down bears and similar dangerous animals. When they reach the Great Wyrm stage of their life, they're the only chromatic dragon to reach Colossal size, about 70ft in length. Even the main head of Tiamat, the chromatic dragon goddess, is that of a red dragon. The first famous red dragon was Tolkein's Smaug from The Hobbit, who is the template on which all modern dragons come from. Which is a shame in some ways, because it feels like it limits them to a flying crocodile-dinosaur kind of form. I tried going in a more medieval direction with the Red Dragon, giving it some more leonine features, though he's still quite scaly and bat-winged. In college my group got cocky and thought, "They just hatched! We can take 'em." Those silly billies, not realizing that red dragon hatchlings are already as smart as humans. What were the consequences? It was a close to a TPK. Two out of seven of them made it out alive. That's excellent illustration, I especially like the catlike face and blue nose. Great work, Blanca. I really enjoy visiting your site. Please . . . keep them coming! Nicely done. I just loved your version of this classic illustration. Congratulations on your 200 post!